Who doesn’t love a good dessert every now and again after a wonderful dinner out? Many diners love to indulge, but there are several restaurants around the globe that take indulgence to an entirely new level – they add expensive jewelry to their dessert dishes. Can you imagine going out to a fancy restaurant, ordering dessert, and receiving a diamond and gold bracelet along with dessert? That’s what one New York City-based restaurant offers its diners – and that’s just the beginning. You’ll be stunned by these 5 radically expensive desserts that are dripping with expensive jewelry. The Wine3 Restaurant in The Fortress, an upscale Sri Lankan hotel, is the home of the Stilt Fisherman dessert. This after-dinner treat is an Italian cassata (an ice cream dessert) that contains edible gold leaves and Irish cream. Layered atop the ice cream is a mango and pomegranate compote and at the base is an enlightened Dom Perignon champagne sabayon. 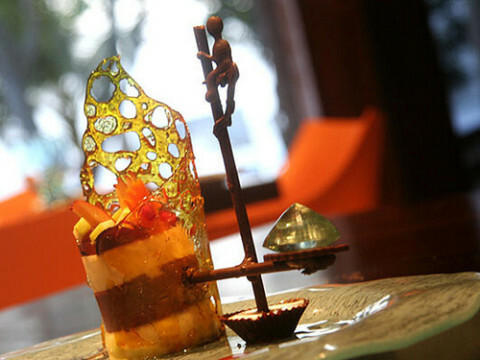 Also on this dessert plate – an intricate sculpture made from chocolate that depicts a scene of a fisherman fishing for an 80-carat aquamarine stone that’s about the size of a soup spoon. Total price: $14,500. If you want this dessert, you have to order it a full day in advance. 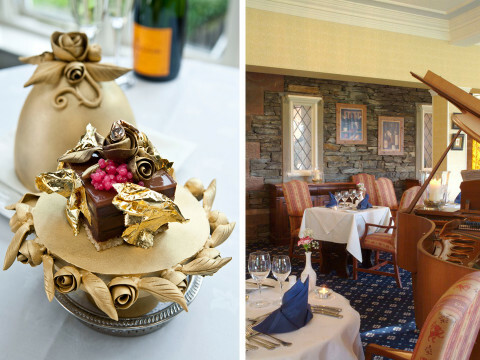 At the Lindeth Howe Country House Hotel in England, Chef Marc Guibert has created a chocolate pudding unlike any other. For starters, it’s made with some of the highest quality chocolate available on earth, and it’s created in the shape of a Faberge egg. Topped with gold leaf and served with champagne and caviar, this dessert has layers upon layers of champagne jelly. Plus, it’s laced with edible gold, because, why wouldn’t it be? To top it all off – a diamond. This dessert’s total cost, then, is $35,000. Oh, and it needs to be ordered 2 full weeks in advance. More of a drink specialty than an actual dessert, the Ono is one of the most expensive drinks in the world, perfect for sipping on after a 5-star dinner. 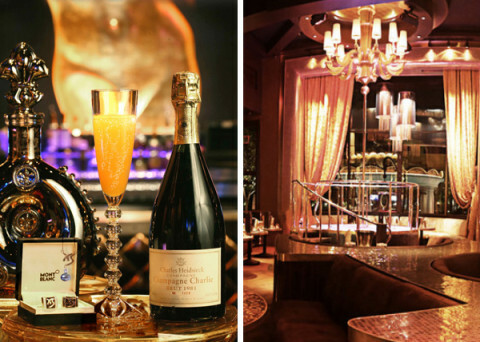 Available at XS Nightclub in Las Vegas, the Ono is a cocktail featuring Charles Heidsieck Champagne Charlie 1981 paired with Louis XIII de Remy Martin Black Pearl cognac. As if the drinks themselves weren’t already expensive enough, they are served with a set of silver men’s cufflinks and an 18K white gold black pearl pendant necklace for the ladies. All the added jewelry runs this fine cocktail up to $10,000, so be sure to sip slowly and enjoy if you ever order the Ono! If you’re craving an expensive hot-chocolate like dessert with some bling after dinner, Serendipity 3 in New York City is the place to go. A team effort with jeweler Euphoria New York, the Frrrozen Haute Chocolate is a rich combination of 28 different cocoas, 14 of which are among the most rare and expensive cocoas in the world. So where does the expense come in? The chocolate is infused with 5 grams of edible gold, and it’s served in a baccarat Harcourt crystal goblet. 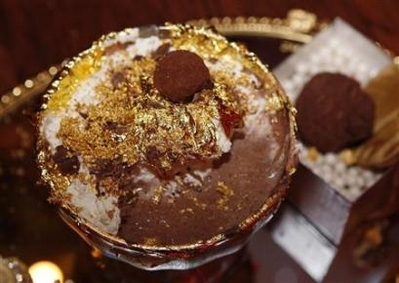 The goblet itself is further adorned with 23K edible gold, and it’s served with a gold spoon. Oh, and there’s an 18K gold white and chocolate diamond bracelet laced around the base of the goblet. Because you get to keep the diamonds after you indulge in the chocolate, this dessert will run you up $25,000. Last but certainly not least, and perhaps the most extravagant of them all, this famous Strawberries Arnaud dessert, available at Arnaud’s in New Orleans, is a definite conversation starter. Meant to be used in conjunction with a marriage proposal, this dessert is a strawberry dish that soaks in a sauce of port, red wine, spices and citrus, all served over vanilla ice cream. After partnering with MS Rau antiques, the chefs at Arnaud’s went ahead and added a 7.09 carat pink diamond to the dish for a bit of added flare. The cost? Just $3.95 million. It is currently the restaurant’s worst-selling dessert, and for good reason. Next time you want to really indulge in all that is the excellence of dessert, why not take home a little piece of Heaven by making sure jewelry is part of the equation? 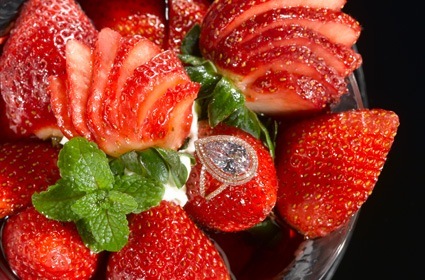 You surely will never forget a pricey dessert if you get to keep the diamonds that came with it! Or, simply visit us at JM Edwards Jewelry to buy your diamonds without the added dessert costs!